The Globe and Mail has reported that Justin Trudeau and senior PMO staff have now retained independent legal counsel in #LavScam. I’ve helped organizations through legal/comms crises many times. • they now can’t take notes, send or receive email, etc. without disclosing them to the police, Ethics Commissioner, et al. None of this would have happened if any of them had paid heed to the law – for instance, using “jobs” as an excuse to enter into a Deferred Prosecution Agreement is expressly prohibited in bribery cases (as this is) and Article Five of the OECD Anti-Bribery Working Group Convention (which Canada has signed). They didn’t talk to any lawyers at the start. Because of that, they’re now going to be talking to lawyers all the time. To, you know, keep themselves out of jail. $50 says nobody goes to jail over this. Well, they should use that as a talking point in the campaign! They have hired lawyers because of a possible RCMP investigation or an actual/ongoing investigation? I wondered about that, then I thought you don’t rent a tuxedo to watch Saturday afternoon cartoons. .. so why all the lawyers @ 500 $ an hour ? Or am I out of date and its 750 to a thou per hr now ? What kind of timeline are we talking? Weeks, months, years? 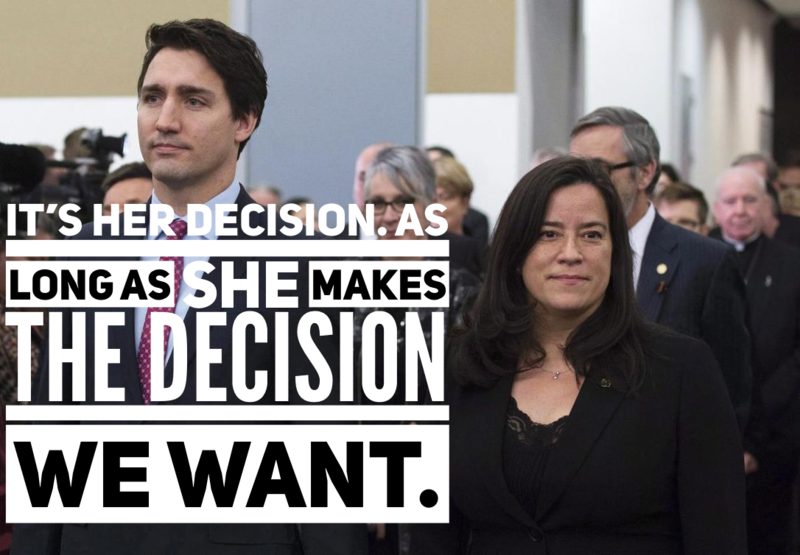 It’s very disturbing JW-R followed the rule of law and acted on the DPP’s recommendation not to offer a DPA to SNC-Lavalin while Trudeau pleaded it was all a misunderstanding. Butts, in front of a Liberal dominated Justice Committee, said she lied, then wouldn’t allow her to rebut his claims. The court of public opinion believes her way more than those two buffoons. They should be footing the bill to defend themselves, not the taxpayers! It’s so easy when it’s OPM (other peoples money). Excellent article! I doubt any of them will go to jail but it probably will push Trudeau out! Jobs!? He’s such a dummy! They (cops) need to look into his bank records. I’m sure a company like SNC has bribed more than Gaddafi and the Middle Easterners! No one finds this strange? https://www.straight.com/news/771496/will-snc-lavalin-and-power-corporation-benefit-trudeau-endorsement-asian-infrastructure Not to mention the creation of the CIB? This detailed inquiry was dismissed. http://blog.friendsofscience.org/2017/11/24/infrastructure-bank-questions-of-potential-conflict-of-interest/ How did the creation and Canada’s support of the Asian Infrastructure Investment Bank affect NAFTA w USA? https://business.financialpost.com/opinion/john-browne-chinese-bank-challenges-u-s-supremacy And… were they planning a large carbon trading network b/t France, Canada and China via these bodies? Caisse, SNC, Power, Bombardier, McCain all deeply embedded in France https://blog.friendsofscience.org/2018/04/29/new-france-the-carbon-conquest/ Caisse and Al Gore’s GIM just made a new long-term fund…but what of this? https://gellerreport.com/2019/03/how-could-i-miss-it-harry-reid-john-kerry-and-al-gore-named-in-arevas-28-billion-corruption-case.html/?utm_source=dlvr.it&utm_medium=facebook Seems a lot of questions to be answered and either SNC or Caisse are in the midst of them. coming up with a new illegal scheme (future scandal) to pay for the first one. After all, those who Liberals deal with have deep pockets and will pay for favours. They were talking to a lawyer…they just didn’t listen to her. That’s nothing. Just wait until JWR runs for leader. Rather than properly embrace her, they will move heaven and earth to prevent her from becoming leader. It’s that mindset that has come to infect most of them and it’s precisely what’s killing the party. Sure. Apologies – sometimes we block lots of loons at once: red X’s, Shamrocks, yellow jackets, Nazis, etc., and innocent folks get caught in it. Interesting; their contempt for the rule of law has now cornered them to seek refuge in it. What irony! Will their arrogance prevent them from listening to it again? If someone is “lawyering up” as you say its because the police have come calling or they have been issued a summons to appear. And Warren you know that simply wasn’t an option. So much chaos I feel the need to hide under my bed! But what of Conrad Black’s musing? It equally is chaos! Consider the source – a senior member of the laurentian elite – silver spoon and all. That he deflects from the issue at hand is no surprise. He asserts Peter MacKay had “… earned considerable stature as either lawyers or legislators.” I Loled that. And that she is what he says she is I have little quarrel. JT and the LPC have gone done the virtue-signalling bunnyhole and these are kind of negative results you get. BUT he is lying through his teeth when he says SNC-lavalin and the decades of corruption are the side show. He KNOWS that’s a pile of dung. Many of his friends are in the firing line here and he’s trying to deflect in a most disgusting manner. Didn’t know that Warren. Certainly the media and the oppo parties aren’t saying that. Where did you hear/read about it? That has been very frustrating for me. There has been little play in the press that the DPA statutes were copied from the Americans and others…..and has specific guidelines as to why an outfit like SNC would NOT qualify for a DPA. SNC lavalin is gonna be saved by the Quebec government in part by using equalization money. The rot runs to the very core of this country. Perhaps going to jail is the new way of doing government that Trudeau liberals promised. Wouldn’t it be great if they went to jail. The problem is JWR also has an agenda. Thank goodness she came forward however. The corruption we have seen so far is likely just the tip of the iceberg. This may sound trite but negative energy only attracts more negative energy leading to a vortex of self destruction. The seeds for this are often sewn into the fabric of ones past and are difficult to uproot unless one chooses the path of truth, integrity and personal honesty. The RCMP are going to have a hard time covering this up especially Deputy Commissioner Michaud. The RCMP charged SNC Lavelin for bribery in the first place and since bribery does not allow for a DPA..deferred prosecution agreement under the Anti Bribery Convention and since the economy can’t be used either for DPA the PMO office with the PM have been caught redhanded implicating themselves in obstruction of Justice on a number of points. Then factor in undue pressure as alleged by JWR and the criminal charges are very relevant and unless the RCMP set the example that corruption at any level especially at the highest level is not acceptable to Canadians by bringing these charges they are a disgrace to law enforcement and even undermine their own investigation and eventual charges against SNC Lavalin. Hypocrisy at its finest on display for the whole world if nothing is done That Wernick guy needs added charges for perjury and inciting violence with his words about assassinations. A true disgrace to Canadians as well. This liberal party with Justin Trudeau rammed through the change to the criminal code allowing DPA’s in order to benefit a company that was not eligible for a DPA and this government further muddied the waters by trying to obstruct justice by pressuring then firing the Justice Minister who would not flinch on the Rule of Law and allow the DPA which had already been denied by the Public Prosecution Office who followed the Rile of Law as well. Can’t wiggle out of obstruction of justice charges no matter how you spin it.